A figure who was vital in the ascent of Memphis blues and rock ‘n’ roll in the late 1940’s and early 1950’s, but whose own recording career was limited and thus is known almost exclusively through occasional mention of his name in the stories of much bigger national stars, from B.B. King to Johnny Ace. Richard “Tuff” Green was born in Mississippi in 1911 and like so many other musicians from the state he made his way to Memphis as a young man where he established himself as a bass player who in time led what was widely considered the greatest band in the city, featuring such notable figures as drummer Phineas Newborn Sr., sax players Ben Branch and trumpeter and future head of Hi Records, super producer Willie Mitchell. Green was the top draw for years on the Memphis club scene, a band that was capable of playing any style of music for any audience. 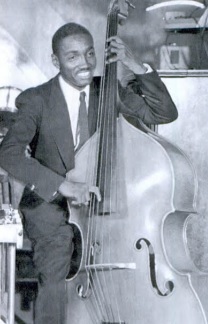 Reared in jazz – Green had went to school with swing legend Jimmie Lunceford – conversant in everything from country to blues, and capable of adapting all of that rock, the group had no need for a record contract and the hassles of going on the road to earn a living. However Green DID provide the means for other aspiring artists to get into the record business as he ran a recording studio out of his house, cutting songs in his living room behind a wide array of acts just getting their start, among them B.B. King and most of the his fellow Beale Streeters, cutting a major hit for Roscoe Gordon along the way. When Sam Phillips’ more professional Memphis Recording Studio opened it curtailed this aspect of Green’s activities, but he continued to be the number one band in town for live gigs, even as members departed for stardom of their own.